Ms. Victoria Mwanri Elangwa was appointed a Member of Board of Directors of the Energy and Water Utilities Regulatory Authority (EWURA) in May 2018. She is currently the Director of Human Resources and Administration at Medical Stores Department (MSD), supervising Human Resources, Administration and MSD capital projects. 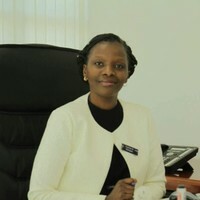 She has worked as a Human Resources Consultant, champion and change management leader. She has over 13 years’ experience on strategic leadership, coaching and strategy formulating. She has also worked with state Tanzania Electricity Supply for over four years; and over ten years’ experience in human resources management, job evaluation, job design, competency-based management and l as performance management modules; she also has sound knowledge of Industrial relations. She has also worked with Tanzania Mortgage Refinance Company (TMRC) as Head of HR and General Administration; and Barrick Gold Tanzania as Senior HR Officer. She holds master’s in business administration- Majoring in Finance; and Bachelor of Arts Degree in Sociology both from the University of Dar es Salaam; 2008 and 2000; respectively. She is a certified Human Resources Analyst (CHRA).